Arch Chinese is the best online Chinese writing learning tool I have found. It is completely free. I like the user interface. The stroke order animation is awesome! Thanks for your very valuable sharing. This tool is really good. Comparing with the original Chinese character stroke order tool that I referred to, Arch Chinese has better user interface. 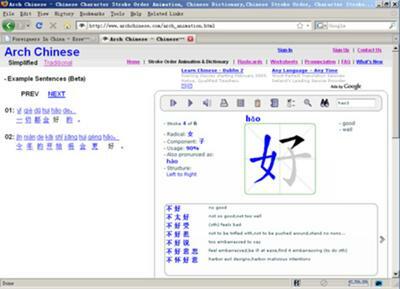 Its Chinese character search function is very flexible and powerful. Its stroke-order function can animate more Chinese characters as well. Actually I have change the Chinese character stroke order animation tool that I originally referred to "Arch Chinese". So your sharing has brought about the enhancement of this web site and will help every visitor. Thanks again. Please everyone share YOUR good knowledge and experiences as well. Click here to choose a topic to contribute on. Join in and write your own page! It's easy to do. How? Simply click here to return to Practicing Chinese Writing .